Even addresses: Wednesdays and Saturdays, 4–9 a.m. Odd addresses: Thursdays and Sundays, 4–9 a.m. Even addresses: Mondays between 1–6 a.m. and Fridays between 4–9 a.m. Odd addresses: Tuesdays, 1 a.m.–6 a.m. and Fridays 4 a.m.–9 a.m.
Watering trees, shrubs and flowers is permitted any day from 1–9 a.m. if using a sprinkler, or any time if hand-watering or using drip irrigation. 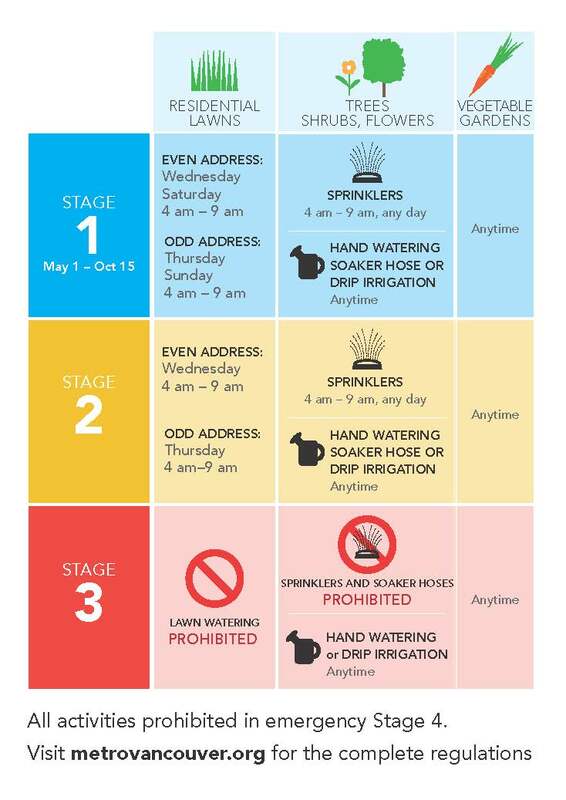 View the below image for information on the stages of residential water regulation. Learn more about lawn & garden care and how to save water!